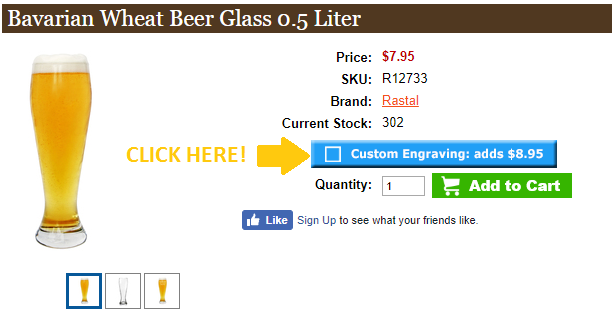 Personalized Beer Glasses | Order a custom etched glass - no minimum! A personalized beer glass makes a fine gift for any occasion: as a memento for your groomsmen (or bridesmaids), a gesture of appreciation for employees, or even a “just because” gift for your sweetheart. German Steins has multiple collections of countless sizes & styles, letting you celebrate Bavarian heritage, your favorite German beer, or just a cold drink on your favorite day of the week. Wedding gifts don’t need to be all crock pots and cutlery. Sure, these items are practical. But so are custom wedding beer glasses. You don’t want to gift just any old beer glass, though. What you need is something special, like a custom, laser engraved, authentic German beer glass. With a heartfelt message and 16 ounces of fine German beer, you know they’ll feel the love with a personalized etched beer glass. Personalized beer glasses commemorating your wedding day make excellent gifts for groomsmen & bridesmaids. And what a clever way to make sure they never forget your anniversary! Dispose of the boring old tradition of raising a silly little flute & give your party a personalized pint beer glass before the toasts are made. A light and fizzy Kölsch is so much better than champagne anyway. We carry more than just beer steins. You can find a huge selection of steins, beer mugs, masskrugs, beer boots and more at German Steins. Our custom engraved beer glasses can feature up to five lines of text in over a dozen different fonts. Design the perfect gift for your favorite beer aficionado, or your favorite German. Stake your claim in German drinking history! Have your name inscribed on an engraved glass mug from GermanSteins.com and carve yourself a place in your German heritage. We offer laser engraving services on a wide variety of glass steins, boots and mugs for all enthusiastic and proud beer drinkers wanting to honor their German ancestry. 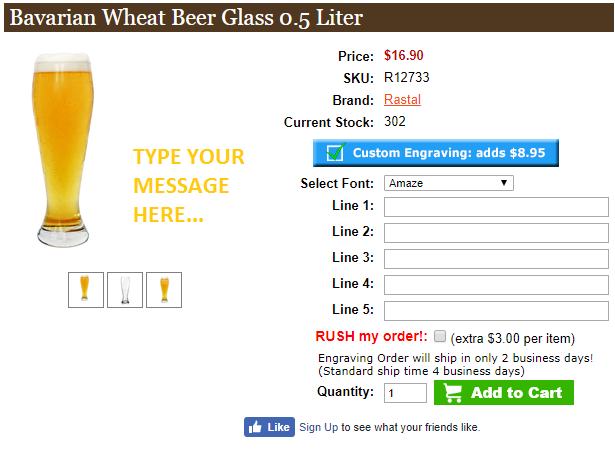 We personalize your German beer mug just as you specify. 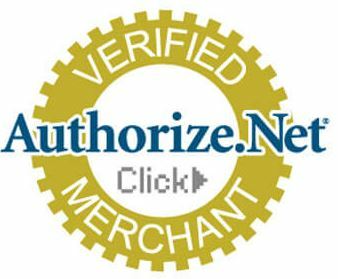 Depending on the piece, you can have up to three or five lines of text of your choice engraved on the item, including names, dates, or any other important information. It’s up to you. 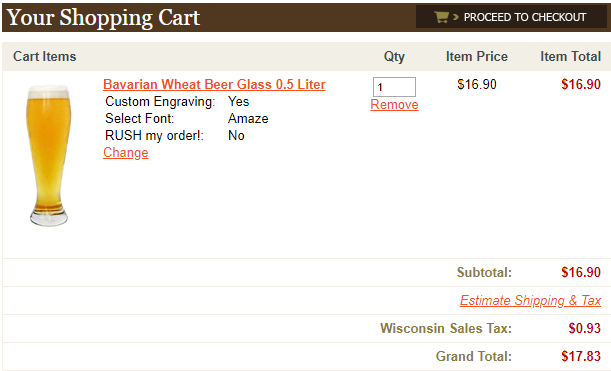 Enter your text into the prompts on our glassware product pages and see a preview of your unique message. For some items, you have the option to laser engrave an image instead of text. Email your artwork to us to find out if we can engrave the image of your choice to a glass German beer stein. An engraved glass beer stein, boot or mug makes an excellent drinking companion and the centerpiece of a collection of authentic German drinkware. Get your customized laser engraved German beer stein perfect for any occasion today. Gifting can become difficult for gift givers with high standards who want to really hit it out of the park. Even though they know you are a creative gift giver, your friend will not see this one coming: an authentic, hand crafted personalized German beer stein, boot or mug boldly displaying his or her name on the side. Customized glass beer mugs are a great, unique unique groomsmen gift idea. While money clips, pens and flasks are common gifts, they won’t garner half the reaction you’ll get from the groomsmen when they unwrap a customized glass beer stein. With their name or initials on it, it’s the one groomsmen gift that gets used years after the wedding. Personalized German beer steins are perfect for any gift giving situation—birthdays, Christmas, or college graduation. For Father’s Day, get your Dad a Dad glass beer stein and have his name engraved along with a personalized message. He’ll never use another mug again. Take a break from gift cards and candles. Get your friend, family member or significant other a gift they’ll never forget. Purchase a customized engraved glass German beer stein today! Browse all the German beer steins for sale from GermanSteins.com.